I've been suffering from hayfever since I was around 10 years old. I suffer horrifically ever year, and I normally take every precaution I can think of to try and prevent my symptoms as much a I can. I do get prescribed medication but you can buy other versions of these items over the counter at any pharmacy. I'm going to start with probably the most obvious Hayfever reliever. There are many different types and brands of hayfever tablets and some are different strengths to others so be sure to read the details on the back of the box. I do get prescribed tablets, however these are the ones that my mum bought at Tesco. Although after comparing the boxes, we realised their wasn't much difference between my tablets and the ones she had bought over the counter. 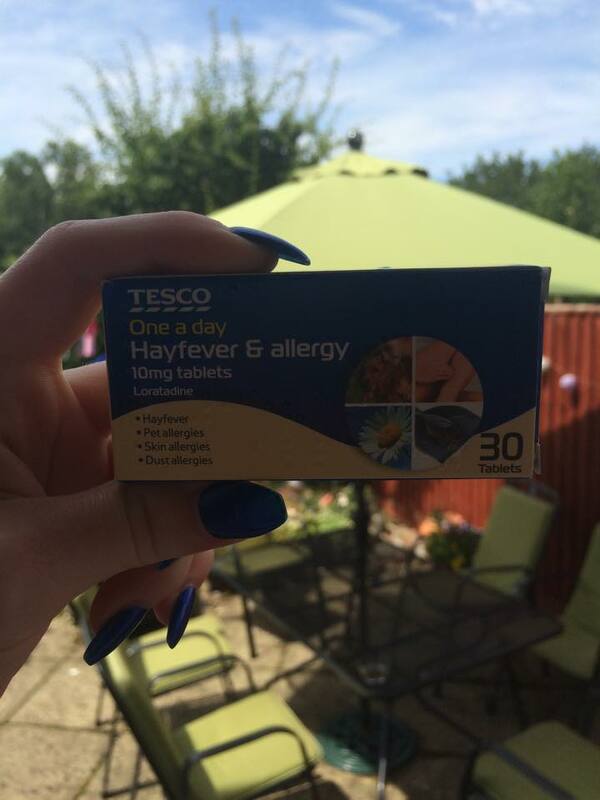 I take 1 hayfever tablet every morning when I wake up, as instructed on the box. Next, is my nasal spray, I normally use this when I get an itchy nose. I squirt two sprays into each nostril to relieve the itch and I do find this normally works and my nose becomes less irritant. 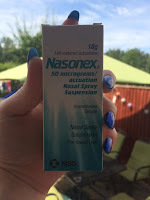 This is my prescribed nasal spray however there are plenty available in pharmacies and supermarkets, the only problem with these are that with most of them, you have to be over 18 years old, so if you are younger and suffering hayfever it may be better to go to your doctors to see what they can recommend. My prescribed eye drops help relieve any itchiness I get in my eyes. I can use these up to four times a day, however I don't normally use them as regularly as my nasal spray or tablets. Different years I find different areas on my face irritate me however recently, my nose has been worse than my eyes. 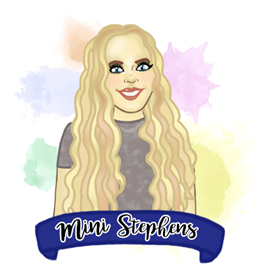 I normally place one or two drops in each eye when needed, and I do carry the small bottle, as well as some tissues, around with my in the summer season just incase my eyes start irritating me. 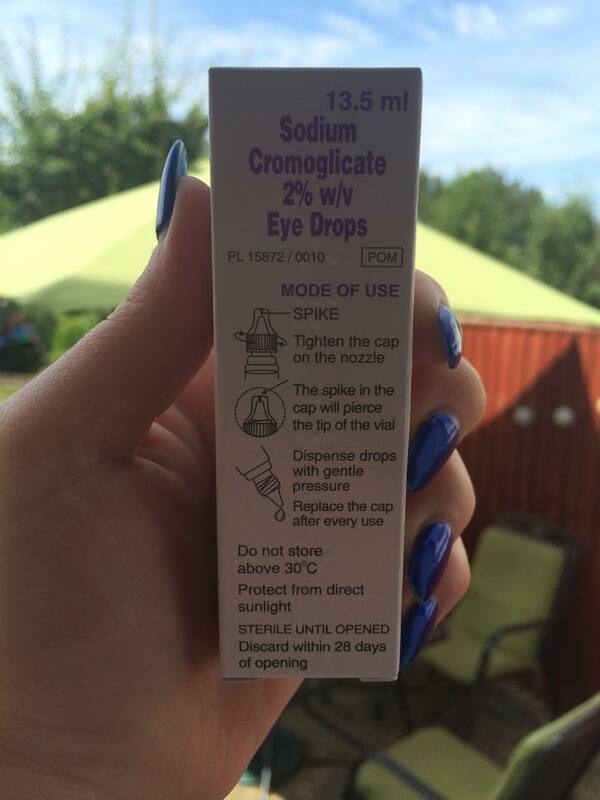 Eye drops are also avaliable to buy over the counter for £3 to £5 which isn't too expensive. With all three of these items, if you are buying them, I recommend you only buy nasal spray or eye drops if and when you need them, as otherwise the cost will build up over the summer. However, I would buy some hayfever tablets, as although they don't completely stop your symptoms, they do minimise them. Eating a teaspoonful of some local honey each day, also helps my hayfever. Although this may seem a bit strange, but I've been doing this since summer last year, and it really does help me. 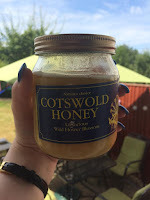 Alongside my other medication, I always ensure I have some honey every morning in the summer season, whether its on toast or I get a teaspoon and outright swallow some honey. The honey pictured below is local to my area, the honey you eat HAS to be from your local bees otherwise it won't help you at all. The logic behind it is that you're affected by your local pollen, so if I'm in Birmingham, my allergy's are coming from Birmingham pollen, but if I went on holiday to Swansea for a week, my allergy's for that week would come from Swansea. So if you eat local honey, that your local bee's have collected, from your local pollen that is giving you allergy's, then you will be building up an immunity to pollen, minimizing your symptoms (kind of like an injection where you are injected with a tiny bit of the disease so your body can build up an immunity against that particular disease). Now, although this hasn't been scientifically proven, and many people say it's just working as a placebo, I think it's like many remedies, different one's work for different people. I definitely recommend giving it a go, and after a month or two, you don't see any difference then perhaps just continue with your normal relievers, but it's always worth a try right? Finally, my last tip to help prevent your hayfever is wearing sunglasses. 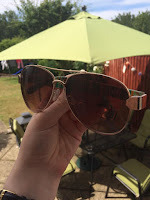 Now I know this one seems too simple to even be worth trying, but when I'm outside during a summers day, wearing sunglasses always helps prevent my eyes from becoming itchy. I think this because my eyes are covered and so they aren't directly targeted by pollen. Even if the sun has briefly gone behind the clouds, ensure you keep your glasses on and see what happens, and if it helps you at all. Let me know if any of these tips help you this summer, or if you think any of them are useless, as they didn't help you at all. "Being allergic to pollen, makes us sneeze, it would be worse, if we were Bees"